The following document discusses a ruling for Daniel Hartwell against the owners of the ship Rachel​ and a counter claim by the owners against Hartwell. ​Click on the image below to view the full document in a new window. Know all Men that Jonathan Peele, Joseph Winn, John Winn, Willard Peele, Pickering Dodge and Nathaniel Appleton all of Salem in the county of Essex, owners of the Ship Rachel and Daniel Hartwell of Conway, county of Hampshire, now of Salem in the county of Essex, mariner have agreed to submit the demand made by the said Jonathan Peele and others against the said Hartwell which is hereunto annexed, and all other demands between the said Parties (excepting an action between them, pending in the County of Essex in the G. Com. Pleas [the General Court of Common Pleas]) to the determination of Nathan Dane, Esq., John Pickering Jr. Esq., and John Prince Jr., Esq. 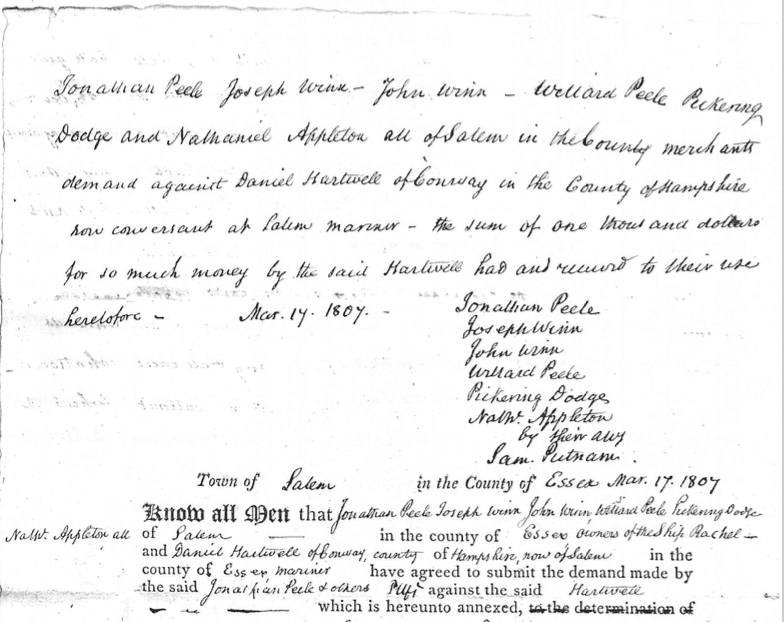 Then the above Jonathan Peele, Joseph Winn, John Winn, Willard Peele, Pickering Dodge, Nathaniel Appleton by their atty..
And the parties within named agree, that the said Hartwell shall give in evidence against the Plaintiffs in this action, a certain note dated 25 Oct 1803 signed by Joel Root for four hundred dollars, and that the referees are to award against the Plaintiffs such sum (if any) as the said Root was by law liable to pay - and the award in their case, whether for or against the Plaintiffs, shall include and be a final discharge and determination of all demands which the said Hartwell hath against the Plaintiffs and against the said Root or ..., upon or for said note - and of all demands the said Hartwell hath against the Plaintiffs, for any & all causes whatsoever - and all of the demands (excepting the action pending as within mentioned) which the Plaintiffs have against the said Hartwell. Salem March 20 1807 We the referees within named having notified, met and heard the parties within and above named on the ? ? within and above referred to due award and determine that the said Hartwell receive against the Jonathan, Joseph, John, Willard, Pickering and Nathaniel the sum of two hundred and eighty two dollars and ninety cents in full of all the demands submitted in this same as aforesaid and also ? of ? being seventy four dollars and fifty eight cents.